History tells of a Benedictine Monk named Émilion who lived in Brittany during the eighth century. He swore his loyalty to a count in southwest France and agreed to go with him and work in his household. 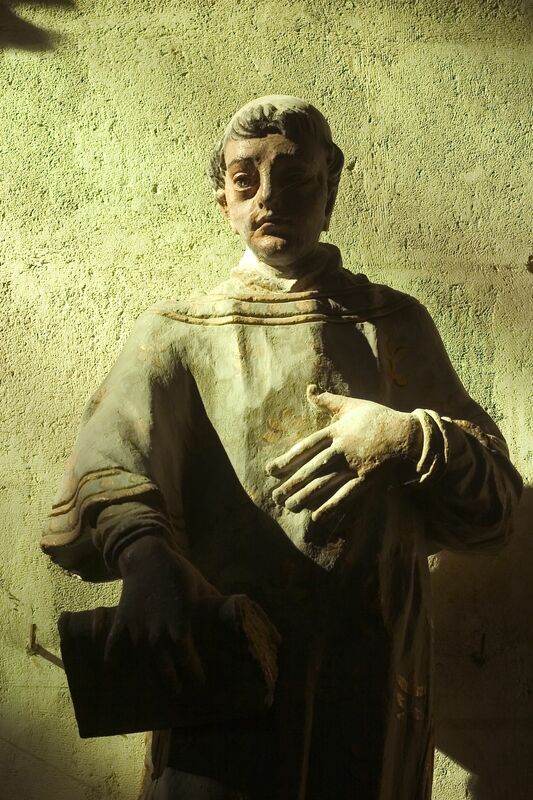 Émilion was a baker and would often give some of his master’s bread to the poor. When the count found this out, he fired Émilion from his service and threw him out of his house. Upon his ousting, Émilion vowed to spend the rest of his life in worship and solitude. He journeyed a ways up the Dordogne River and settled near an enormous piece of limestone rock. Émilion spent the next several years carving an underground cave out of the limestone, complete with a stone bed and chair carved into the wall. With time, it was said that Émilion was able to perform miracles, and people began to visit the hermit monk for healing. Faithful people soon developed into a following who lived with him, helping him carve out his cave. Émilion lived the rest of his days in the cave with his followers. He died in 787. After his death successive generations of monks carried on with Émilion’s project and carved a vast network of underground caves and catacombs. The fame of the area, now known as the town of Saint-Émilion, grew and it became a major religious center. Many faithful passed through on the pilgrimage route to Santiago de Compostela. Some of these faithful remained and these followers are credited with the planting of vineyards and the growth of the region’s wine industry. With time, the tiny town of Saint-Émilion became a center of religious importance with a reputation for its excellent wine. 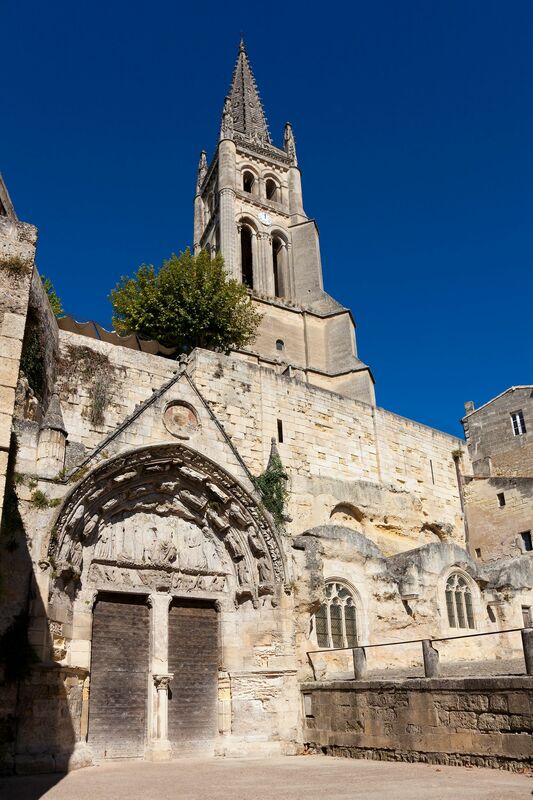 The Monolithic Church of Saint-Émilion was originally constructed in the early twelfth century from the same limestone rock where Émilion first dug his cave. The now-famous church stands watch over the 2,000 inhabitants of Saint-Émilion as well as the world-renowned vineyards that surround the town. Deep below the church–with its three naves, its gothic windows, and its 175-foot high bell tower–lies the original cave of Émilion, the hermit monk. 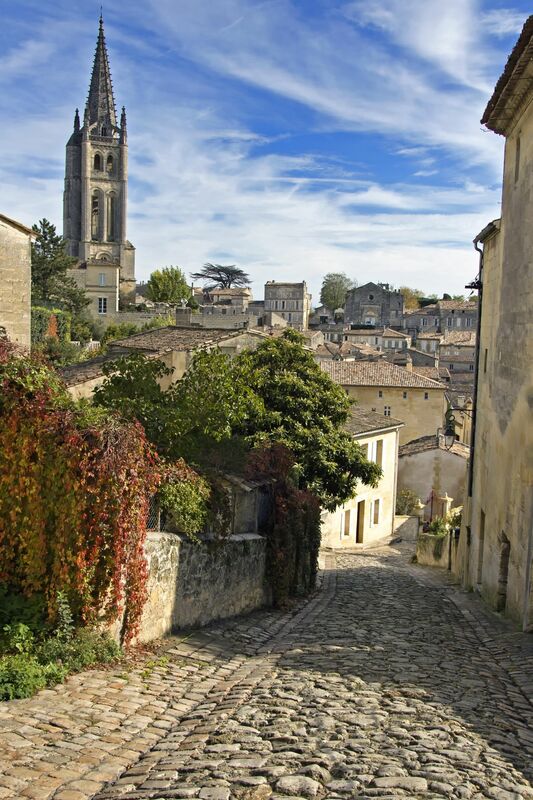 Today the town of Saint-Émilion is a UNESCO World Heritage site with Romanesque ruins, religious monuments, and a maze of medieval streets. It is also one of the leading wine regions of the world, renowned for its red wines based on the Right Bank version of the Bordeaux blend–heavy on the Merlot, a good dose of Cabernet Franc, a sprinkle of Cabernet Sauvignon and filled out (perhaps) with tiny touches of Malbec, Petit Verdot, and Carmenère. Surrounding this luscious region are several villages that produce deep, flavorful red wine similar in style and standards to those of Saint-Émilion itself. Four of these have earned the right to append the name of Saint-Émilion onto the name of their village in the labeling of their wines and are thus considered to the satellites of Saint-Émilion. These four satellites are the villages of Saint-Georges, Montagne, Puisseguin, and Lussac. 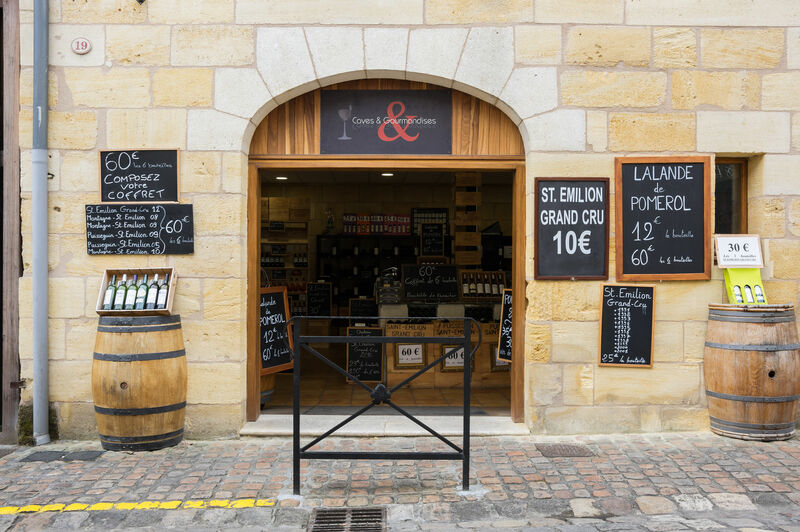 Saint-Georges-Saint-Émilion: Located directly to the north of Saint-Émilion, the Saint-Georges-Saint-Émilion AOC is the smallest of the four satellites and occupies a tiny spot along the edge of the Saint-Émilion region itself. The vineyards are planted to approximately 75% Merlot, 20% Cabernet Franc, and 5% Cabernet Sauvignon. The village of Saint-Georges (often referred to as a hamlet) has a population of around 500 people and is part of the Montagne Commune. The wines produced from the vineyards of Saint-Georges are allowed to use either name (Saint-Georges or Montagne). Montagne-Saint-Émilion: The Montagne-Saint-Émilion AOC literally surrounds the Saint-Georges region and lies along the remainder of the northern boundary of the Saint-Émilion AOC, which is itself–for the most part–defined by the path of the Barbanne River (La Barbanne). Montagne is the largest of the satellites of Saint-Émilion. The Montagne (the Butte de Calon) itself is the highest point on the Right Bank. The soils range from sand and clay in the north, to a central plateau of clay and limestone and limestone slopes in the south. Vineyards are believed to be planted to 75% Merlot, 20% Cabernet Franc, and 5% Cabernet Sauvignon. The wines of Montagne-Saint-Émilion are known to be full-bodied and rich with supple tannins. Puisseguin-Saint-Émilion: The Puisseguin-Saint-Émilion AOC is located north of the border with Montage and east of Lussac. The town of Puisseguin (population: 861) is filled with ruins from Roman times, and takes its name from two words, “Puy” and “Seguin.” Puy is an old Celtic term for “the hill of powerful wine.” Seguin is the name of a Roman officer who served under Charlemagne and settled in the region around 800 AD. The terroir of Puisseguin is similar to that of the surrounding regions and contains a mix limestone, clay, alluvial gravel, and sandstone soils. The vineyards are reported to be planted to 80% Merlot, with the remainder mainly Cabernet Franc (and a bit of Cabernet Sauvignon). The wines of the region have been described a quite fruit-forward while young, with aromas and flavors of licorice, mint, and other herbs evolving as the wines reach 6 to 8 years of age. Lussac-Saint-Émilion: The appellation of Lussac-Saint-Émilion is the northernmost of the satellites. The village of Lussac, named for a gentleman called Lucius or Lucaniacus who is credited with introducing viticulture to the area during Roman times, is so low-key that the tourist bureau lists a visit to the town of Saint-Émilion (5 miles away) as the top tourist activity. The topography of Lussac- Saint-Émilion is diverse; the south-east covered with slopes of clay and limestone, the north a mix of gravel, clay, and sand; while the west, a slightly elevated plateau, is mostly sandy gravel. Vineyards are reportedly planted 70% to Merlot and 20% Cabernet Franc, leaving just 10% planted to Cabernet Sauvignon (with a rare sprinkling–perhaps–of Malbec, Carmenère, and Petit Verdot). The wines of Lussac-Saint-Émilion tend to be elegant, velvety, and generous and are often compared to those of Montage-Saint-Émilion–its neighbor to the south. 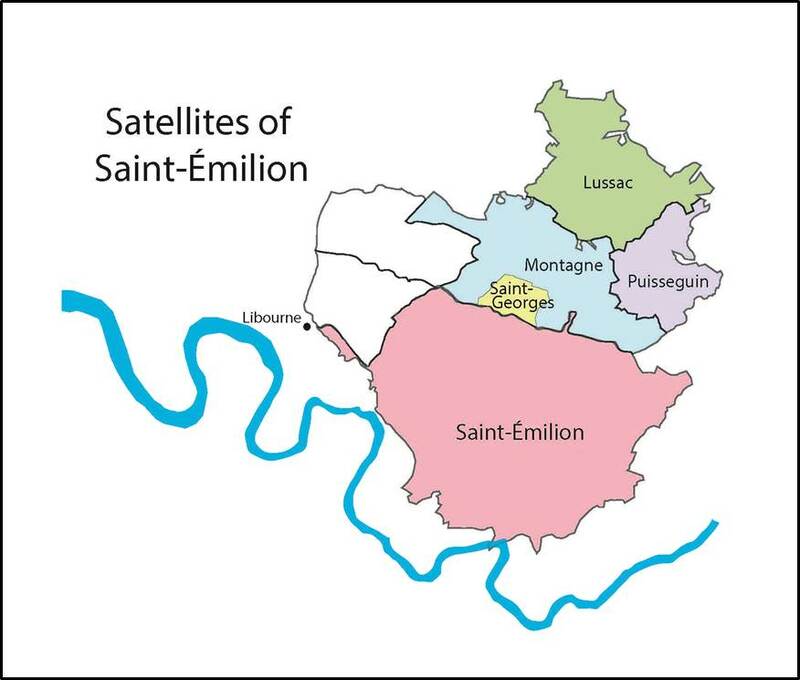 The Lost Satellites: Between 1936 (when the AOCs for Saint-Émilion and its satellites were approved) and the 1970s, two other regions–Parsac and Sables–were allowed to append their names to that of the Saint-Émilion AOC. However, they are no more. Sometime in the 1970s, Parsac merged with Montagne, and Sables was annexed into the Saint-Émilion AOC. Click here for an excellent handbook of the regions of Saint-Émilion (and the rest of the Right Bank as well), provided by the Union des Maisons de Bordeaux.